What are Herniated and Bulging Discs? The discs in your spine are basically fluid filled sacs that are the cushioning system that sit between the vertebrae in the spine. They consist of a tough, yet flexible outer shell that protects the soft, jelly-like center. Since these discs sit between the vertebrae and are part of the spine, they are very near the network of nerves that service the spine and other parts of the body. A bulging disc is when the disc literally bulges outside its usual parameters. Bulging discs are actually fairly commonplace as people age. The spine begins to compress with age, which then in turn compresses the discs, pushing them flatter and in an outward direction. It is only when the bulging portion of the disc comes in contact with nerves that it becomes a painful problem. If the disc bulges far enough, it can begin to put pressure on the nerve, causing moderate to severe pain. Since the nervous system communicates to many places all over the body, a bulging disc in the spine can actually cause pain in the leg. 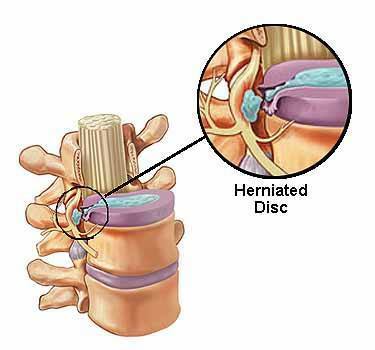 Herniated discs are when the disc actually breaks, spilling the jelly like inside material into the space around the disc. The inside material of the disc is caustic, and, once in contact with anything outside the disc, causes severe pain and damage to the surrounding nerves. A herniated disc is also known as a ruptured or slipped disc. While most people experience pain from bulging and herniated discs, some will never experience pain from this condition at all. It depends on the severity of the bulge or herniation and on the specific individual anatomy of a person. If pain is experienced from herniated and bulging discs, there are treatment options. Some physicians will choose to begin conservatively, with medications, physical therapy, or chiropractic treatment. Should conservative treatment fail, a physician will often begin to explore other options. A diskectomy is a minimally invasive procedure that can be done either in an inpatient or outpatient facility. This procedure involves removing the bulging or herniated disc material, thereby removing the source of pain. Many clinical studies and actual patient testimonials have shown this procedure to generally be successful at alleviating the pain due to herniated or bulging discs. There is also the option of spine surgery to treat a bulging or herniated disc. A microdiscectomy is similar to a diskectomy, where the herniated disc material is simply removed. Another option is spinal fusion surgery, where the surgeon will remove all disc matter and fuse the two vertebrae together, creating one solid bone. Both surgical procedures have also been shown to have success in alleviation of a patient’s pain due to herniated discs.